The cops set up an unlocked bicycle in a sting operation a few years back, and he ain't happey they did so. What's a guy prone to taking things that don't belong to him to do? His lawyers say the dude was tricked, enticed, ENTRAPPED! That is not playing fair!! The Dutch Supreme Court has rejected the lawyers arguement. Tuesday's court ruling said placing an unlocked decoy bike didn't make the suspect do anything he had not intended doing beforehand. The station was being plagued by thefts, and the cops did the logical thing in an effort to catch the miscreants. One of Southern California's best, most respected, Bloggers is Keven Korenthal. It is one of greatest shames that his longtime, popular, blog, SoCal Pundit, was shut down by despicable hackers, a while back. 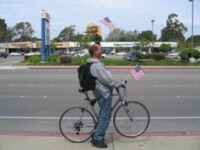 One of the great things about his old blog was that he occasionally wrote about bicycling. He now is a respected contributor to Red County, a well known Right of Center, national website. Today I joined 200 riders and countless staff and friends at the Challenged Athlete’s Foundation Tour de Cove fundraiser. 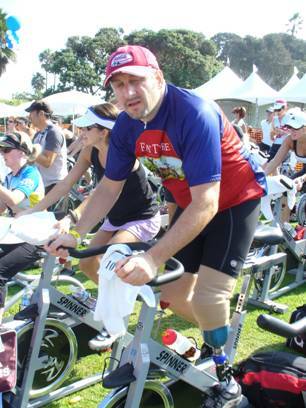 The event which included a half Triathlon (in which I did not participate) and a 4 ½ hour stationary bike ride event (which I did) that included various spin instructors and participation by various “celebrity” amputees. Some of the stars that each participated in the Spinathon (as well as parts of the half triathlon included Sarah Reinertsen, Major David Rozelle and Oscar Sanchez. While they cycled on stationary bikes and hand cycles positioned on the stage, I and 200 non-amputees did our thing on bikes facing the stage. Of all the amputees that attended and participated today, only one of them spun for the whole 4.5 hours. It was tough work and I was exhausted by the time it was all done. But I put my all into it because I want everyone who donated money to CAF in my name to feel they real got the most for their hard earned dough. It felt pretty great when the MC announced the fact at the end of the ride. I felt like I really accomplished something today. Which reminds me, just because this event is over does not mean you can’t still donate to the effort. And don’t forget, I still have the Solvang Metric Century coming up. 65 grueling (but scenic) miles of 8% grades, switch-backs and blind corner descents await me on November 15, 2008. Ever wondered why bicycle shorts are always black? What's the fashion conscious male cyclist to do? It's Hunting Season in many parts of the United States, and elsewhere. Some folks hunt the Animal Kingdom's fine-feathered friends. Do you have a License to Hunt? Pedaling While Plastered: Is there a Law? The law states that bicyclists are subject to the same rights as other vehicles, which conversely means they are subject to the same penalties, including DUI in California. The California Vehicle Code states that it is unlawful for a person to ride a bicycle on a highway while under the influence of alcohol or any drug. His blog is meant to bring attention to his business, I'm sure, but that doesn't make his point any less important. He writes that a first time DUI offense is typically filed as a misdemeanor. He says the penalties can include fines and mandatory community service. A conviction remains on some sort of personal DMV record for 3 years. Check the law in your own state to see how the state treats drunk driving cyclists. A bicyclist led a state trooper on a 5-mile, slow-speed chase on Highway 58 east of Eugene, prompting troopers to set up a roadblock and tackle the cyclist to make him stop. At Long Last Google Ads Pay off! Last week I found a check for the astronomical amount of $101.19! My shock over this developement was not the reason for my recent lack of blogging, though, my friends. My job is moving from Huntington Beach to Long Beach, which means a longer commute for me, and I've been caught up in watching the election debates, and watching the Wall St. Bailout coverage, like everyone else.